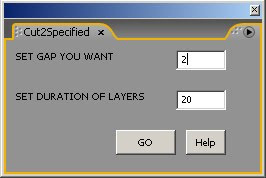 Use this script to trim all selected layers with the duration you specified, you can also specify the gab you want between the layers ( in frames ). This script sequences the selected layers from the current composition time, by offsetting their inpoint. This script will execute the "Time-Reverse Keyframes" Keyframe Assistant found under the Animation menu.